The Lyft IPO should provide prudent investors with a stark warning: It is crucial to ignore the lure of lemmings and groupthink. After this latest round of a deflationary recession/depression consummates, global central banks and governments will engage in an epoch battle to re-inflate asset prices such as never before contemplated. The total market for auto loans now stands at $1.2 trillion. Some may take solace in the fact this level is much smaller than the $9 trillion home mortgage market that brought down the global economy in 2008. Wall Street’s absolute obsession with the soon to be announced most wonderful trade deal with China is mind-boggling. The cheerleaders that haunt mainstream financial media don’t even care what kind of deal gets done. Jerome Powell threw Wall Street a lifeline recently when he decided to temporarily take a pause with the Fed’s rate hiking campaign. It is crucial for investors to understand that the Federal Reserve has not yet turned dovish and the Fed “Put” it not yet in place. Since the autonomy of the Fed has been publicly impugned, Powell has no other option but to continue on this path of raising rates. Description: Pento Portfolio Strategies (PPS) is a Registered Investment Advisory Firm that provides money management services and research for individual and institutional clients. Description: The coming financial apocalypse and what government and individuals can do to insulate themselves against the worst shocks. 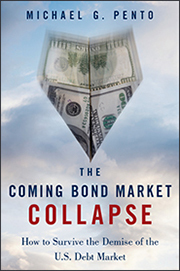 In this controversial book a noted adherent of Austrian School of Economics theories advances the thesis that the United States is fast approaching the end stage of the biggest asset bubble in history. He describes how the bursting of the bubble will cause a massive interest rate shock that will send the US consumer economy and the US government—pumped up by massive Treasury debt—into bankruptcy, an event that will send shockwaves throughout the global economy. Michael Pento examines how policies followed by both the Federal Reserve and private industry have contributed to the impending interest rate disaster and highlights the similarities between the US and European debt crisis. But the book isn't all doom and gloom.